PARIS • Even as football heads into the international break, Paul Pogba has been a busy man handling club and off-field affairs this week. On Wednesday, the French midfielder backed his Manchester United caretaker manager Ole Gunnar Solskjaer, telling Sky Sports that he wants the Norwegian to get the job on a permanent basis. He also insisted that player power was not behind Jose Mourinho's sacking, citing "we were not winning" as the main problem. Later that day, Pogba said he is happy in Manchester despite it being a "dream for every football player" to play for Real Madrid some day. The 26-year-old, upon returning to France duty, has also made world champion rings, modelled on those in many American sports, for his World Cup-winning teammates. For today, though, Pogba will be fully focused on what happens on the field as France face Moldova in their first Euro 2020 qualifier. He insisted that the team will be just as motivated despite the trip to Chisinau being far from the glitter of a World Cup match. I consider them my family. It's a small gift from me. A small gesture like that is nothing because a World Cup is for life. This ring you can lose, but the World Cup you do not lose. 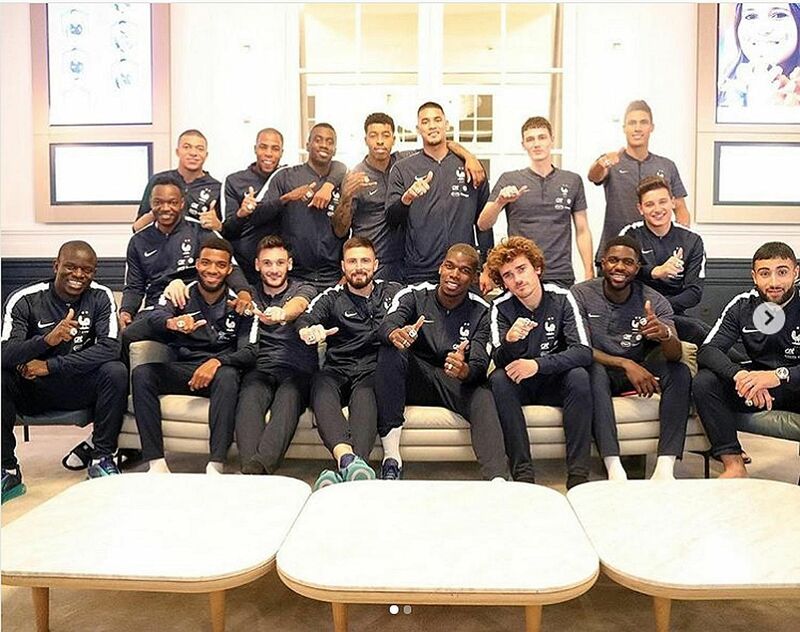 PAUL POGBA, posing with his France teammates and their diamond-encrusted rings (above), which feature the French Football Federation initials and the cockerel emblem on red, white and blue jewels. Les Bleus have played six games - four in the Nations League - since beating Croatia 4-2 to win the 2018 World Cup, but today's Group H opener will be their first leading to a major competition. "It's true that it's not so easy to come back and to have new goals right away after winning the World Cup," Pogba said during his press conference at France's training camp in Clairefontaine. "But we have to, it's our job. We have to be professional. Now we're going right into the competition, it's the qualifiers. We want to win, we want to be the first in the group." France were drawn against Moldova, Albania, Turkey, Andorra and Iceland, who they face at the Stade de France on Monday. The top two qualify for the Finals to be staged across 12 countries. France coach Didier Deschamps warned his team against complacency. "You must be wary. We know very well it will largely depend on us, but this Moldova side will try their luck at home," he said. Moldova are ranked 170th in the world (France are No. 2) and have not won a competitive match - other than a pair of Nations League victories over San Marino last year - since 2013. "There probably won't be much space. You get by with accuracy, movement and by mixing things up," Deschamps added. The 50-year-old also revealed that he would like to remain in his job until the 2022 World Cup in Qatar. His deal runs until June next year, but he admitted any extension would depend on the performance of his team. "For me to be able to carry on until the next World Cup is obviously something I would not be unhappy about, but we'll see," he added. "It's linked to results. But, before thinking about 2022, first come the qualifiers (for Euro 2020)." Deschamps has called up Kingsley Coman after the Bayern Munich forward was omitted from the World Cup squad, and the 22-year-old is determined to play at Euro 2020. "It's never easy, it can be easy if we make it easy," he told reporters. "We have to go into all the matches fully focused and stay motivated. "I think the team is still hungry for trophies. But, to do great things, we first have to qualify." In Group B of the Euro qualifiers, Cristiano Ronaldo has rejoined his Portugal teammates following a nine-month absence from the national team. The 34-year-old Juventus forward was recalled by coach Fernando Santos for home matches against Ukraine and Serbia, having not played for his country since the World Cup. The reigning European champions, who are through to the Nations League semi-finals in June, kick off their campaign today against Ukraine before facing Serbia on Monday.